Dell has finally produced desktop computer that powered with AMD processors. Dell Dimension C521 is a sleeker and more compact performance and entertainment focused package Dell Dimension E520 and E521, and intends to deliver performance and convenient PC set in the affordable price. Dell Dimension C521 is powered by AMD Sempron, AMD Athlon 64 or Athlon 64 X2 dual core series processor chips, and features 533 MHz dual-Channel DDR23 SDRAM, single Serial ATA (SATA) hard drive, choice of multiple DVD+/-RW, dual layer DVD+/-RW, CD-RW/DVD-ROM Combo, CD or DVD-ROM, ATI Radeon X1300/Pro or integrated NVIDIA GeForce 6150 LE graphic GPU graphics card, integrated 7.1 channel audio, integrated 10/100 Ethernet network interface, PCIe x1, PCIe x16, and USB ports. Dell Dimension C521 runs on genuine Microsoft Windows XP (Home, Professional or Media Center edition). vnunet (link dead) reviews Dell Dimension C521 and concludes with overall rating of 3 out of 5 that it’s small, quiet, respectable performance for the size and good value, but it’s lacking in extra features and not much internal expandability. 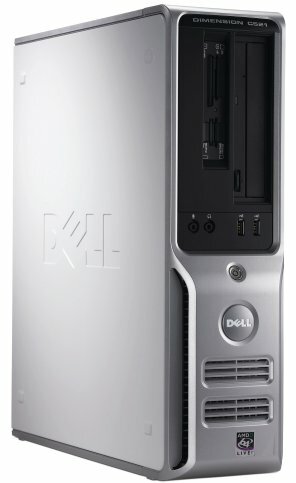 Overall, C521 is good value and fine as a family PC, but ask too much of it and the Dell C521 will show its weaknesses. CNet (link dead) concludes with average rating of 5.5 out of 10 that C521 puts the dual-core AMD Athlon 64 X2 to good use with improved support. However, the reduced-volume case neither saves that much space, nor give you room for upgrading and no Wi-Fi option. Overall, the Dimension C521 is significant because it’s one of the first Dell PCs to include an AMD processor, and Dell uses it to good effect. Unfortunately, that doesn’t save this system from Dell’s failure to incorporate any of the virtues of a modern space-saving PC. PC Magazine gives good editor rating of 3.5 out of 5 that C521 is compact and versatile with a decent bang for the buck, the Dell Dimension C521 is a good first AMD effort from Dell. Best for compact form factor, AMD processor, humongous 320GB hard drive, desktop components, single TV tuner, good USB multimedia keyboard/mouse combo, quiet, thanks to BTX design and slow-turning fans. But, compact form factor necessitates half-height cards, and it’s slower than Intel Core 2 Duo systems, TV tuner isn’t HDTV/ATSC-compatible, ugly external IR receiver for MCE remote, and has only short, 90-day security subscription.